Photo by Mrs. Des Noise, on a vintage mid-2000s phone. 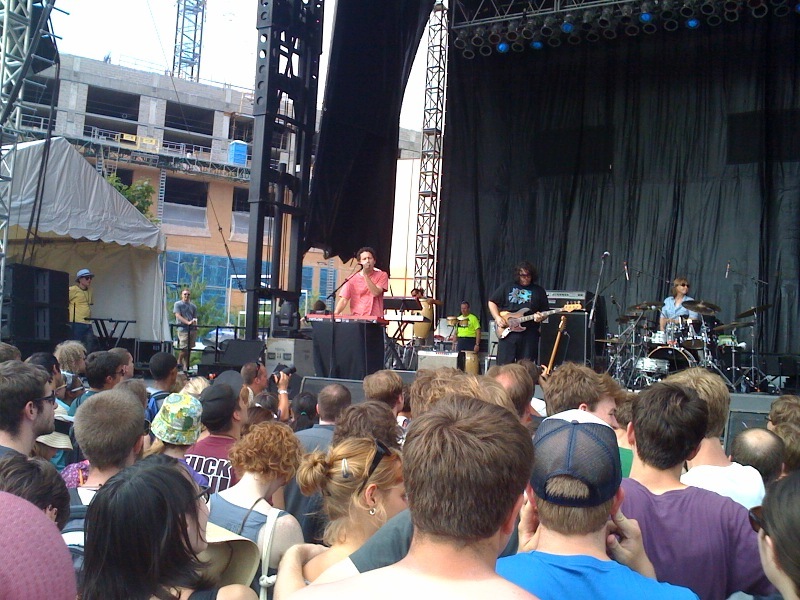 An announced 34,000 attended Des Moines' third annual 80/35 Music Festival over two days this July 4 weekend. That's nothing like the 120,000 who reportedly showed up to the five days of Denmark's Roskilde Festival. 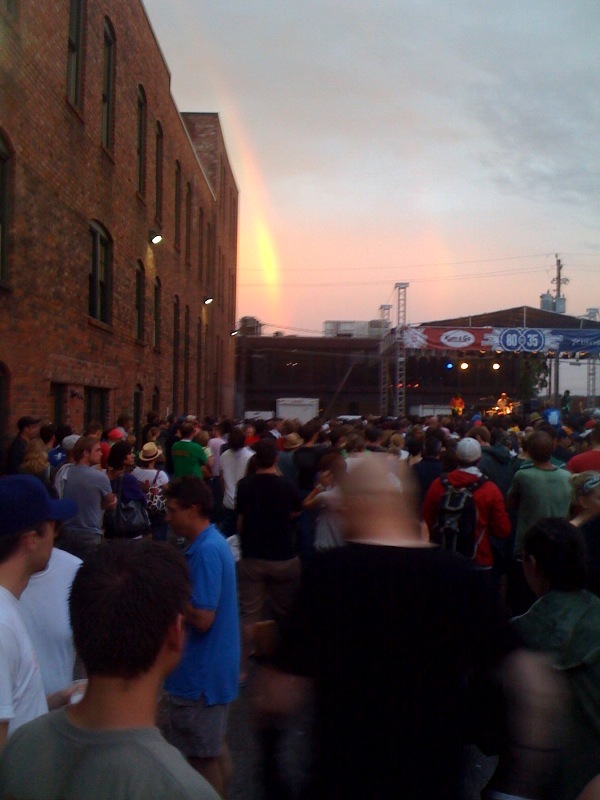 But that's still something for an indie, hip-hop, and jam-oriented festival in central Iowa, an area where even some of the festival's most veteran acts acknowledged they'd never played before. And it's particularly remarkable if you spend even a couple minutes suffering through the comments on 80/35-related newspaper coverage or the festival's own Facebook page, in which neighbors of the people I've found so friendly and welcoming over this past year make Brooklyn Vegan commenters look like Rhodes Scholar Eagle Scout Good Samaritans. Music fans who wanted to go to Sioux City for the time-tested sounds of Santana and Spearhead had that option, and that's cool; 80/35 is about something different, about pushing things forward, and by that measure (full disclosure: I volunteered a few ideas on the booking committee, so please feel free to take my observations as skeptically as you'd like) I thought it was an unqualified success. 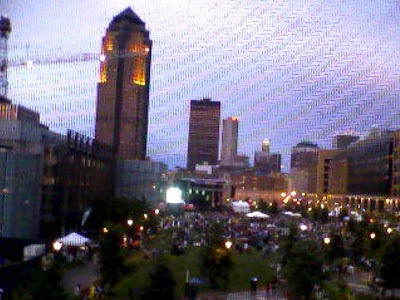 If we want Des Moines to compete as a world-class city for creative young professionals, we need more events like this. 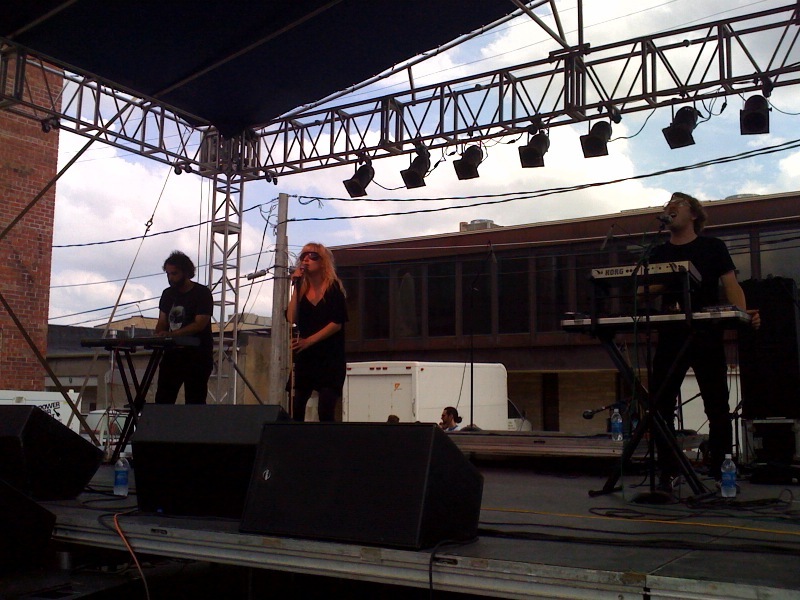 You could divide 2010's festival experience pretty seamlessly between the two days. Between T-shirts soaked with sweat and T-shirts soaked from torrential downpours. Between sets where I was able to take notes and snap photographs and sets where I was keeping my phone in a plastic bag while my supposedly "water-resistant" watch stopped due to the rainfall. My friend Chuck aka Chet aka Chef aka Check lives in an apartment overlooking the festival grounds, so that was our home base, and also home to at least one 32 oz. incident of bros icing bros. Music took place on three stages, one paid and two free, with one of the free stages devoted to electronic and hip-hop artists. The rest of the acts broke down pretty cleanly between the critically acclaimed indie-geek bands and jam/roots/reggae bands. The atmosphere was appropriately relaxed and positive most of the time, with enough security to ensure people's safety but never so much that it felt oppressive. Water was freely availabe from faucets hooked up to fire hydrants, with free water bottles provided-- a great touch. It was clear at times that many people in the audience were unfamiliar with the bands performing, but there was still plenty of spontaneous clapping along. Heck, it almost made me think of Roskilde. Maybe we can get there someday, but for now 80/35 was a fantastic experience in and of itself. Famous-sounding words make your head feel light. Maybe we'll meet again some better day, some better life. Another huge thrill was seeing Britt Daniel at the Vaudeville Mews for the after party, talking to Whitney Nastanovich ahead of the Poison Control Center's set. I always had a sense that Britt and the rest of Spoon are true music fans, and it was great to see that they didn't just collect their paycheck and go back to their hotel; they actually participated in the local scene and went to hear (at least a little? not sure when Britt left) new music. Of course I had just eaten a huge slice of, like, alfredo garlic pizza at Fong's, complete with a generous helping of Rooster Sauce. So I can't be sure how Britt felt about my repeatedly breathing on him, "I'm sooooo glad you're here!" I did introduce myself, perhaps making matters worse, and I think I said how great Spoon's set was, but I neglected to mention how I'm a huge fan and how Transference is maybe my favorite album of the year. I did remember to say that I'm a huge Deerhunter fan and that I like how they're huge Deerhunter fans, too, even adding the stalker-ish detail that I remember seeing Britt and Deerhunter's Bradford Cox talking backstage at the Pitchfork festival a couple of years ago and being so happy. Britt was cool about all this, though, telling me that's the first time he and Bradford ever met. "He's a sweetheart," I'm pretty sure I said. "He's a sweetheart, and he's hilarious," Britt replied. I agreed, told Britt again how happy I was he was here and that the band he was about to see was really good, and then moved up to the front for PCC. We could slip away. Wouldn't that be better? I was lucky enough to catch Yo La Tengo live in Omaha last year, and the longtime Hoboken, N.J., rockers played a fairly similar-- i.e., awesome-- set Saturday afternoon on the 80/35 main stage. Singing guitarist Ira Kaplan started things off by apologizing for being late-- they had sincerely lost track of time at nearby event Wing Ding-- and then joked they'd try to be like airline pilots and "make it up in the air." 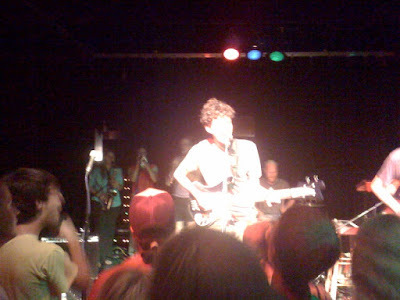 When drummer Georgia Hubley came to the front to sing "You Can Have It All," from 2000's gorgeous And Then Nothing Turned Itself Out..., a fan whom we later determined to be Evangelicals guitarist Todd Jackson joined them on drums (a quiet song without a drummer, Yo La Tengo have surely found, makes festival audiences get restless). I've been able to catch the band a couple of other times, too, and as always Saturday they were able to shuffle naturally between straightforward pop ditties and thrashing noise jams, with bass player James McNew occasionally locking into an unremitting krautrock drone. 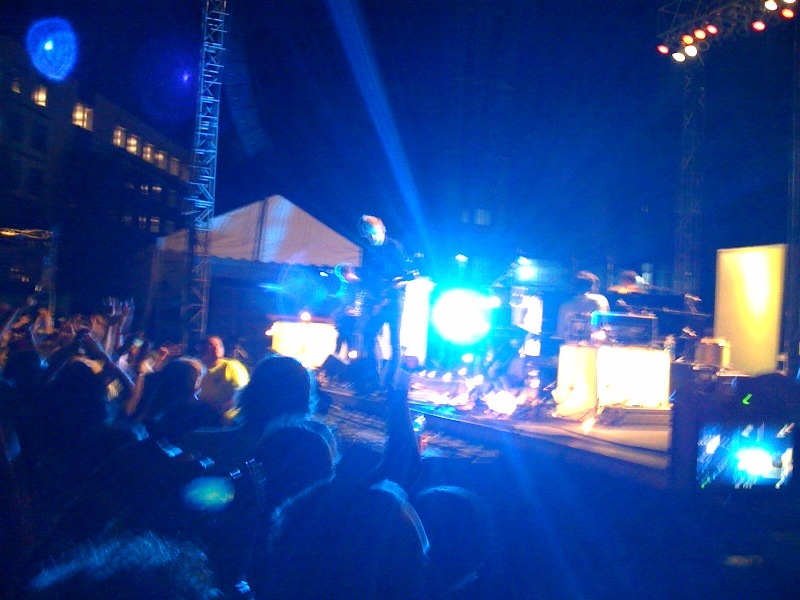 As Whitney N. said to me afterward, "Des Moines has never seen anything like it!" I also caught bits of Canby, Cashes Rivers, Solid Gold, Earl Greyhound, and Slightly Stoopid. Bummed I missed William Elliot Whitmore, who apparently was amazing. No notes, and the day began with an icing. What I heard of Dawes from the free stage sounded solid, sorta Band of Horses or My Morning Jacket or Fleet Foxes rootsy Americana-rock right? 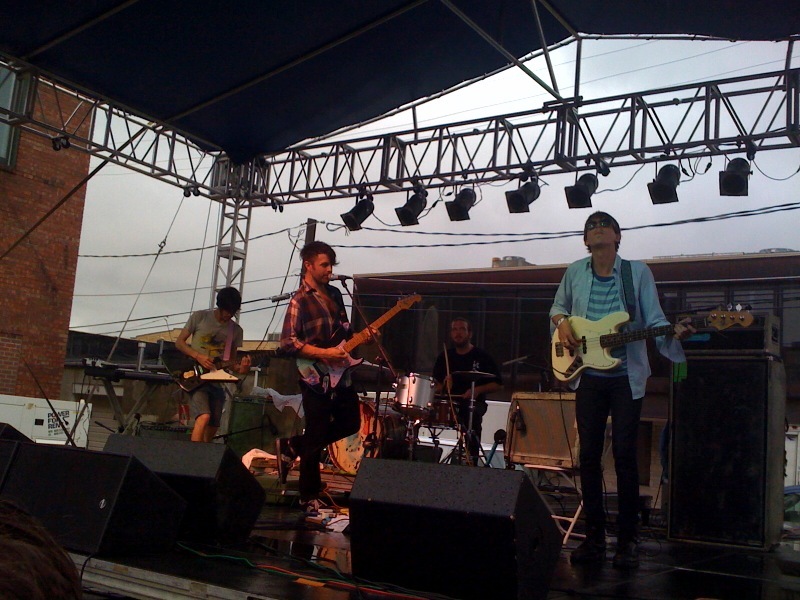 Avi Buffalo impressed, too, on the main stage, with lots of big woolly guitar solos, although their approach to the rain was a little lame-- something to the effect of "We'll keep playing until someone tells us it's bad for our gear." I'm waiting on the weather. 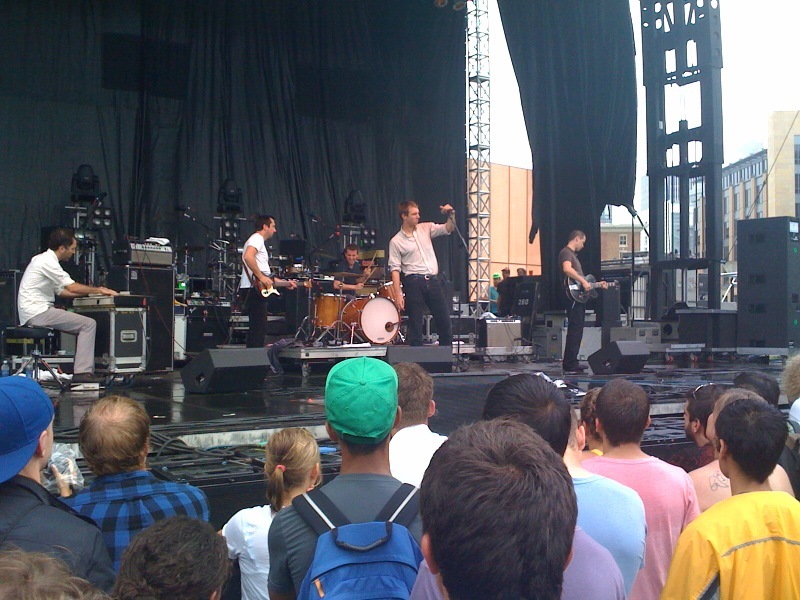 New York's Walkmen handled the elements way better, just stopping everything when the sheet of rainfall threatened their instruments, covering everything up, and then starting over, with nary a complaint. Then again, that laconic stage presence may have worked to their detriment, because crowds here seem used to a bit more audience engagement. The Walkmen are another band I've seen many times, and I was very, very amped to hear standouts like "The Rat," "Thinking of a Dream I've Had," and "In the New Year." Being drenched only seemed to loosen everybody up and make the experience more transcendent. But it was informative to me that hardly anybody around me-- and I was up in the front of the main section, mind you-- seemed to recognize "The Rat," which for a lot of people I know might be all the Walkmen they need. I'll keep that in mind if I get to help book next year's bands again. Our requests for "Louisiana," the only song I really care for off of 2006's A Hundred Miles Off, went unheeded, but that was OK. As with every time I've seen the Walkmen, frontman Hamilton Leithauser kept his face turned toward his left while singing-- dude must know his good side, huh? Over on the free stage, Christopher the Conquered were probably putting on a livelier set-- I was only able to catch a few songs, and Chris Ford had planted a second keyboard out in the sound booth, making for a pretty wild experience... this local band only keeps sounding better and better-- but I was glad to catch a beloved group that simply doesn't end up in Des Moines very often. 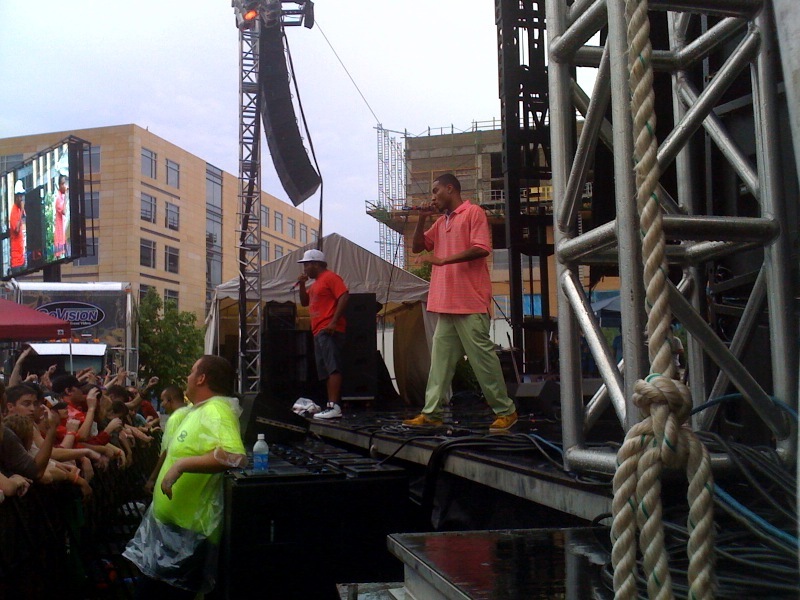 Chicago rap duo Cool Kids ("bringing '88 back") got the crowd going better than perhaps anybody else I saw at the festival... I've been a fan ever since I first heard "Mikey Rocks"-- I think it's now called "I Rock", or vice versa?-- and I've seen clips of their Pitchfork festival performances but never caught them live before. Didn't disappoint. The guy in front of me for most of the set was like their number one fan and they-- they being Mikey Rocks and Chuck Inglish-- kept looking over at him. Pretty neat. 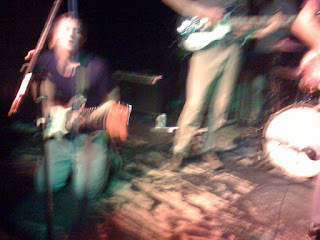 Evangelicals played a pretty solid set of psych-pop, which somebody I was with pointed out sort of recalled the Cure... This was around the time we also realized their guitarist had been the guy who went on stage to play drums with Yo La Tengo. Califone were probably the loudest band I saw all weekend, and their sounds from the free stage might have even been up the alley of the people who had just been with me on the main stage for bluegrassy jam band Railroad Earth if not for all the feedback. Fantastic set, and I wish I had taken notes so I'd have more to say. Good news is on the way. Modest Mouse! By this point I had been soaking wet for hours. I don't have too much to say, but it was a great set, and I was as happy as everybody else when they played hits like "Float On," "3rd Planet," and "Gravity Rides Everything." Somebody gave me a drink with Red Bull in it. I persevered. The Poison Control Center's after parties at the Vaudeville Mews both nights were another of the festival's highlights, even if I was too exhausted to write anything down about them. 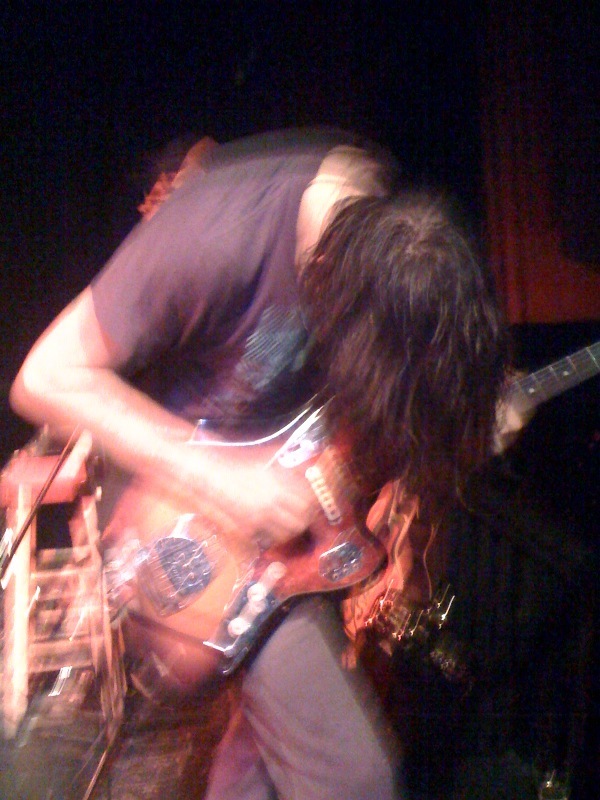 The Ames rockers were making their triumphant hometown area return in the midst of the longest tour in the band's history-- read more about it at PCC's blog-- and it showed in an unusually tight, honed performance. I can't believe these guys were even on their feet after spending all day at the festival just like the rest of us. Each night was a fairly different setlist, as I recall, and night two, the night without Britt in the audience (did Isaac Brock make it out? 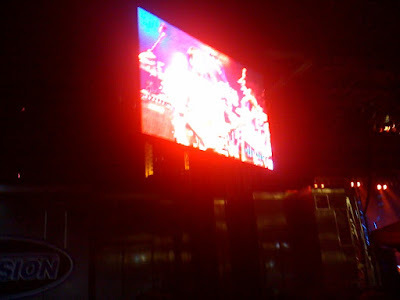 Woulda been neat) had to be the better one: Christopher the Conquered members were backing up the group on horns. Then again, the first night saw original drummer Donald Curtis returning to sing vocals on some of the songs he wrote from the band's new album, Sad Sour Future. Whatever, I've said enough about how great I think these guys are, but it was a blast to have them back in town, if only for a little while. See what PCC's Patrick Tape Fleming had to say about the festival here; here's Des Noise friends Nothing Gets Crossed Out's take. "Anyone who throws things on stage has small and insignificant genitalia." — Les Claypool. 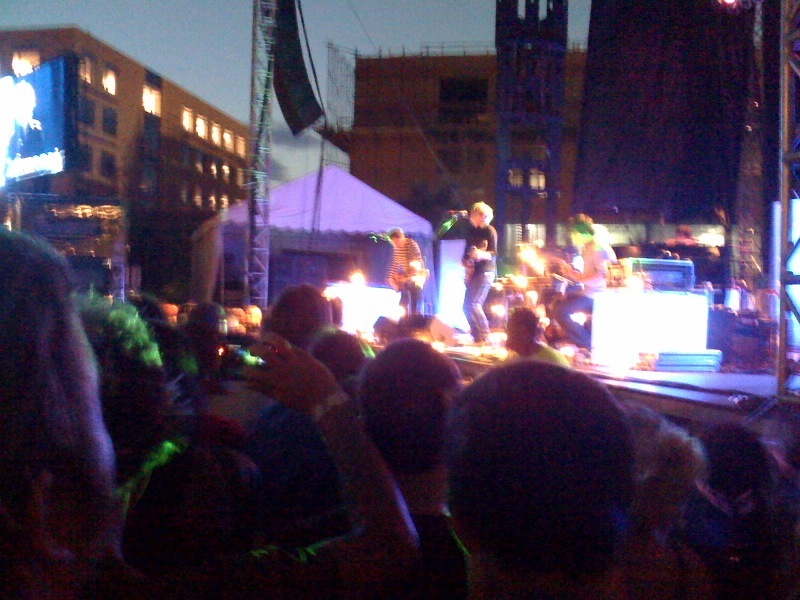 Spoon's last song was "Small Stakes" for sure. I know because it was the first Spoon song I ever heard and I hated it. It put me off of Spoon for about a year. Not sure why, since I like it just fine now. Sorry we missed your "icing", I think we got there just afterwards. Great recap of the weekend! That was definitely "Small Stakes." Played with drums, unlike the album version. "Kiss you right on the face" may have been an ad-lib, or it does sound a lot like "keeps your mind on the page." Also definitely "Autumn Sweater" and "Tom Courtenay." I love "The Rat" but as usual I was way in the back standing next to a stroller. I probably just misheard the lyrics. Thanks dudes!